Well I've been out for lunch today at a local pub for some traditional fayre. 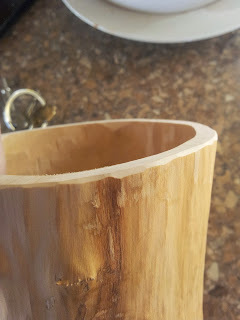 Nice food and lovely Oak furniture that got me inspecting the construction. But, hang on, what's that on the table leg near the wife? 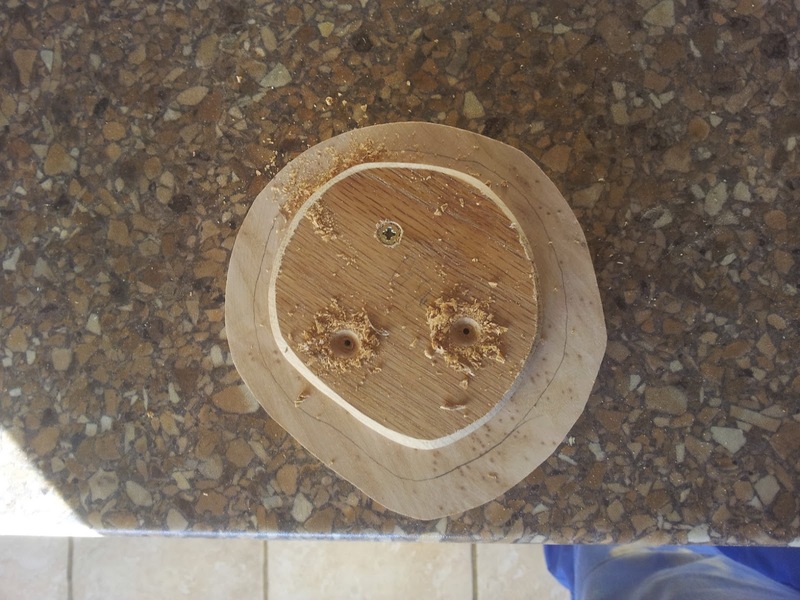 On closer inspection it looks like a mouse! 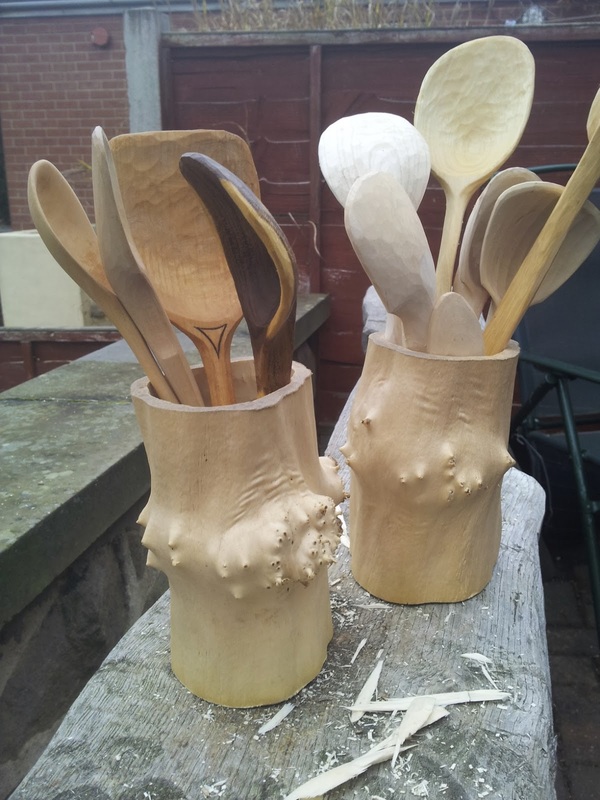 Come to think of it, as I look round the room it doesn't seem to be the only one! 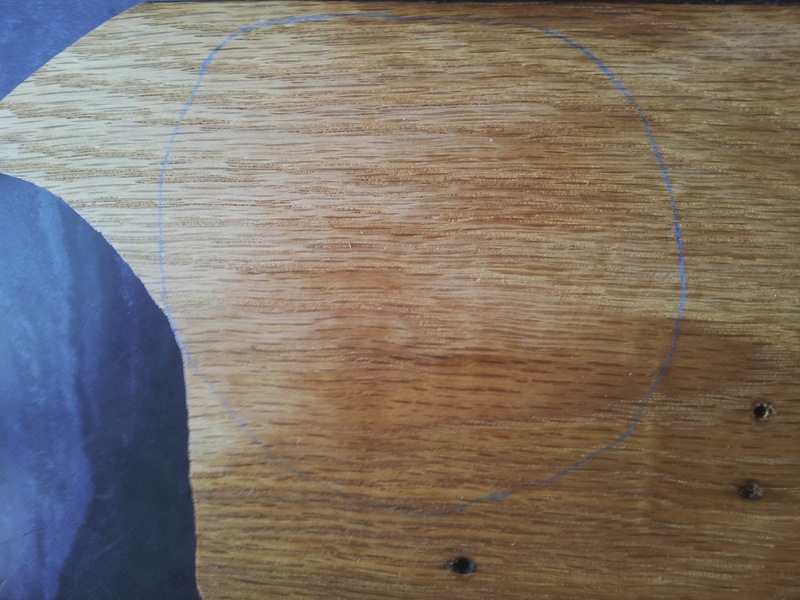 There's even one managed to find it's way onto the bar! 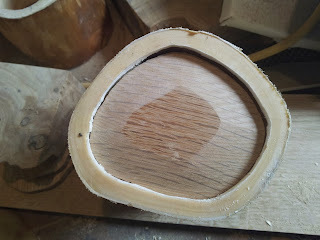 And also onto this beautiful chair with thick hide seat and back. I think I may have covered this part before (making a lid) but never mind it's now all together to give continuity. 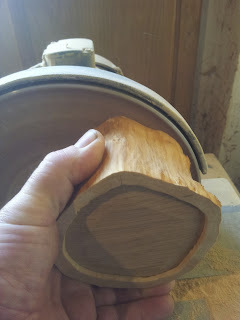 The pot I'm going to lid is a Maple pot I made in the spring; so should be nice and stable. I constantly have loads of pots half finished because I like to give them a nice amount of time to dry and stabilise, particularly if they are to have a fitted lid. 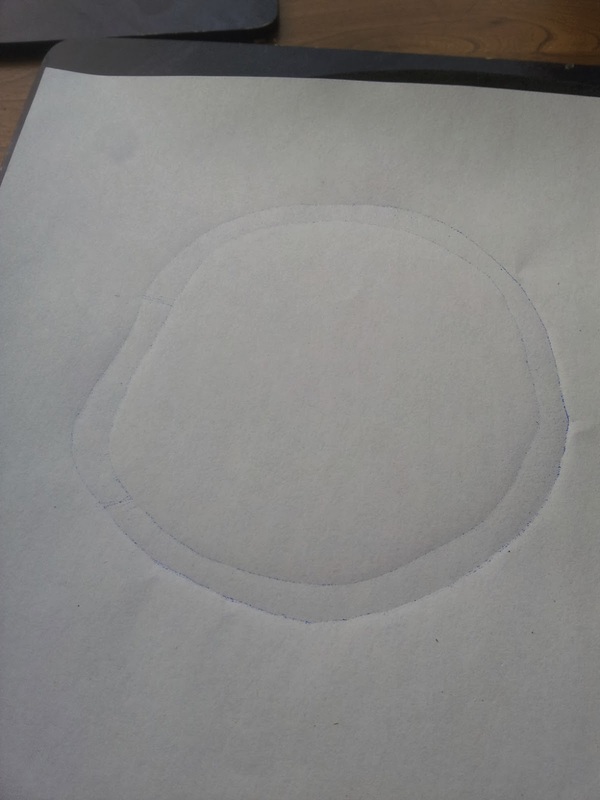 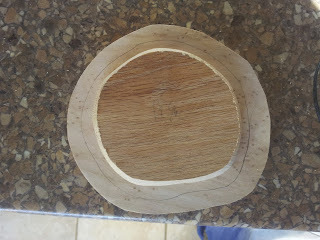 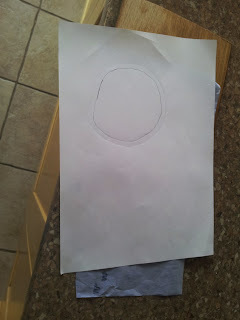 Next I need to make a tracing of the inside of the rim to make a wooden disc. 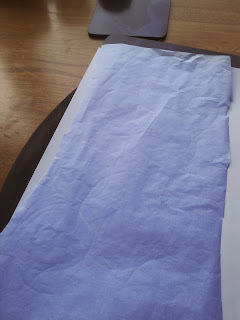 I use SARAL which is just like carbon paper. 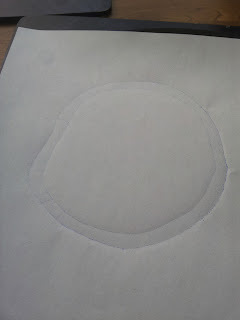 In the picture I have a soft rubber mat that will 'give' a little, then a sheet of printer paper and finally the Saral face down. 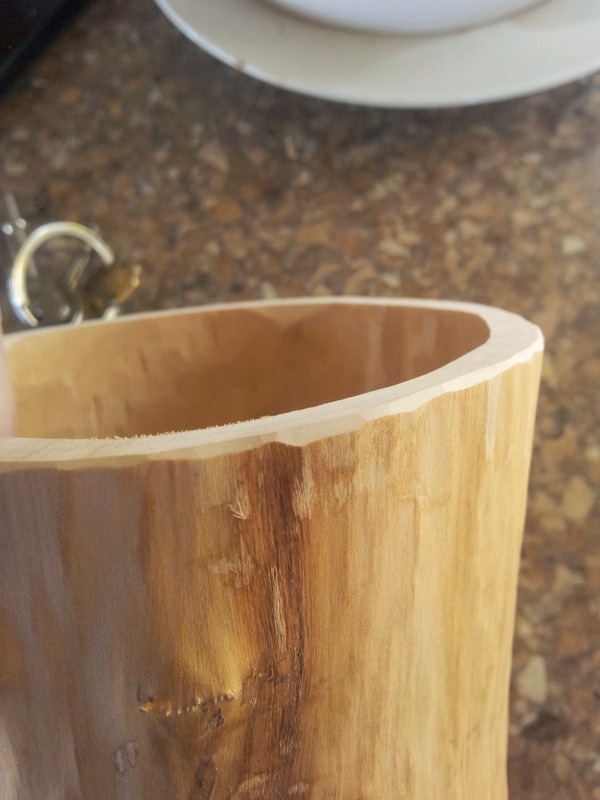 Push down hard with the rim of the pot to make an impression. Cut out roughly at the band saw. 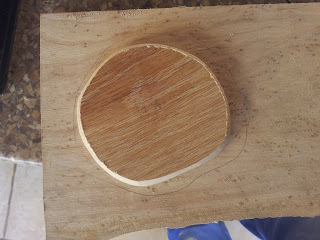 I didn't take a picture but I made the disc a snug fit at the disc sander and chamfered the bottom edge for easy registration. 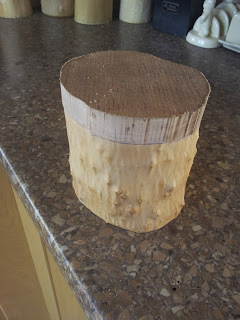 Here's some Pippy Elm about 3/4" thick that I've chosen for the lid. 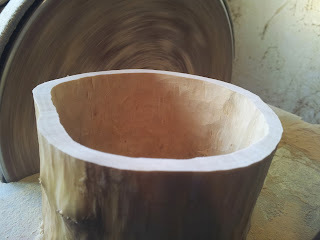 I cut it oversize to start with at the band saw. 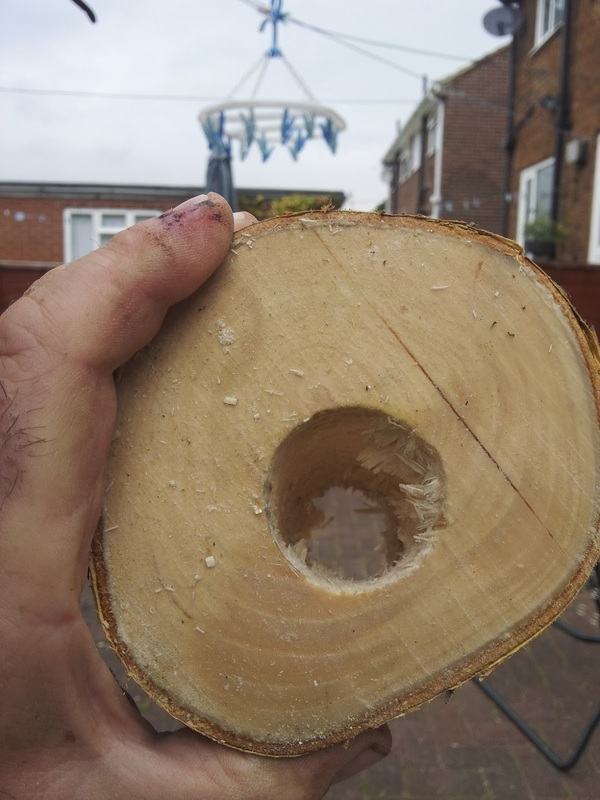 I could have screwed the disc on earlier but didn't in this instance. 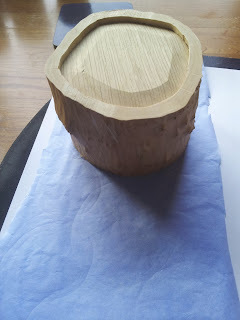 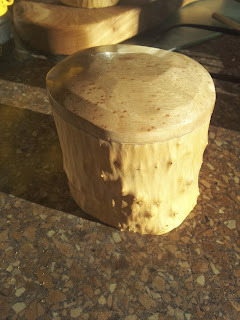 I then pushed the pot on and traced round to get the lid shape. 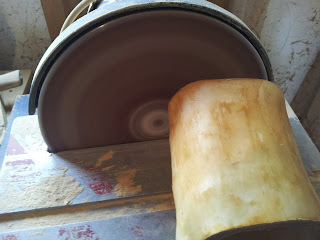 Then tidyed up and did a bit of shaping back at the disc sander. I like to give every edge a nice little chamfer which makes things look tidy and guards against splintering out. 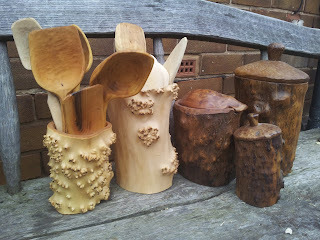 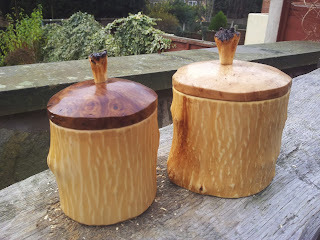 Some more I did in the same batch with Elm, Beech and Walnut lids. 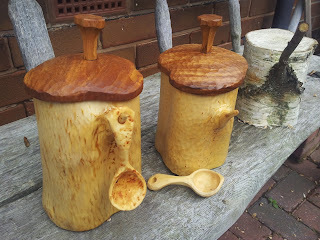 Finally some larger tea/coffee caddies with scoops hung from carved side branches. Before I continue with the making tutorial; I thought I'd expand a little on what I was saying about the time of year you make your pots. 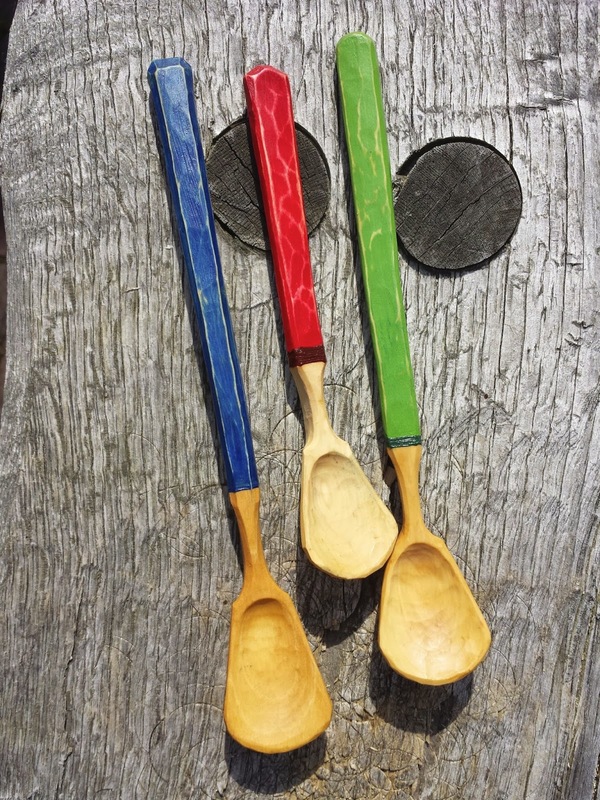 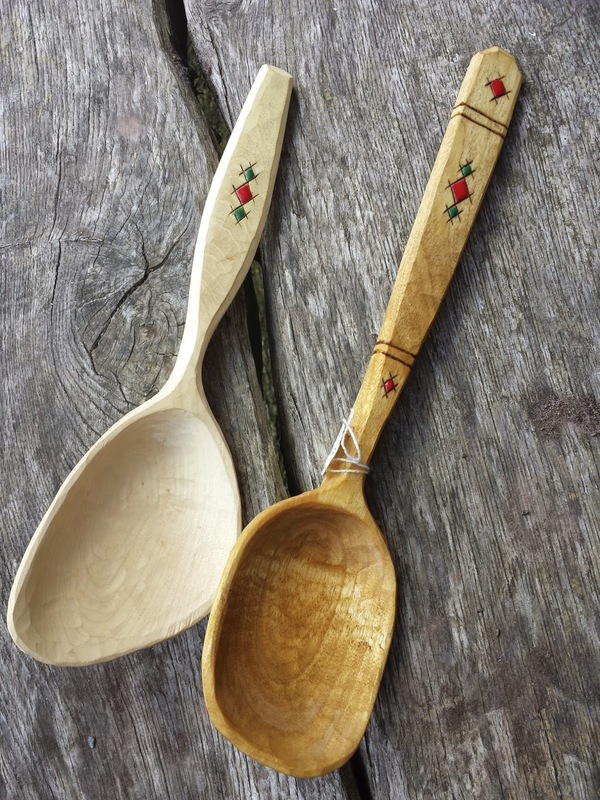 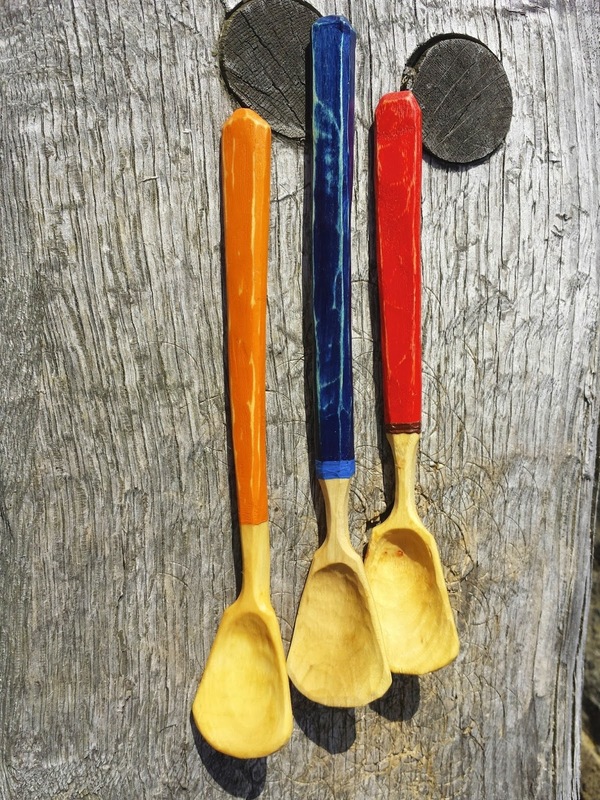 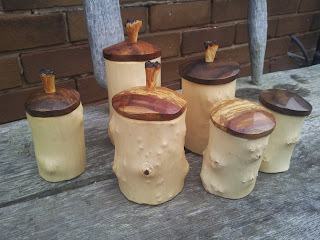 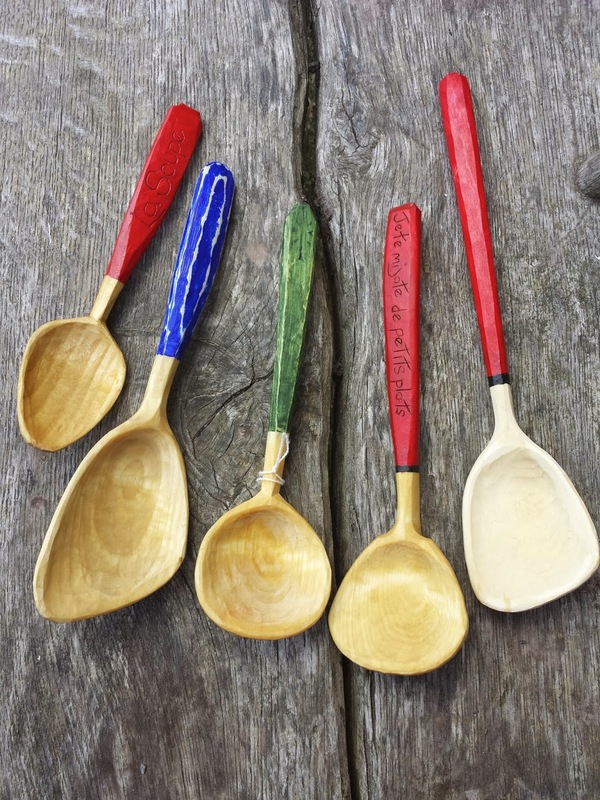 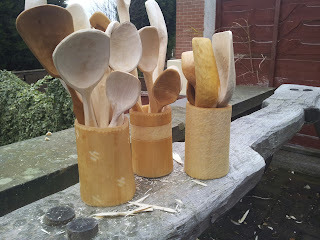 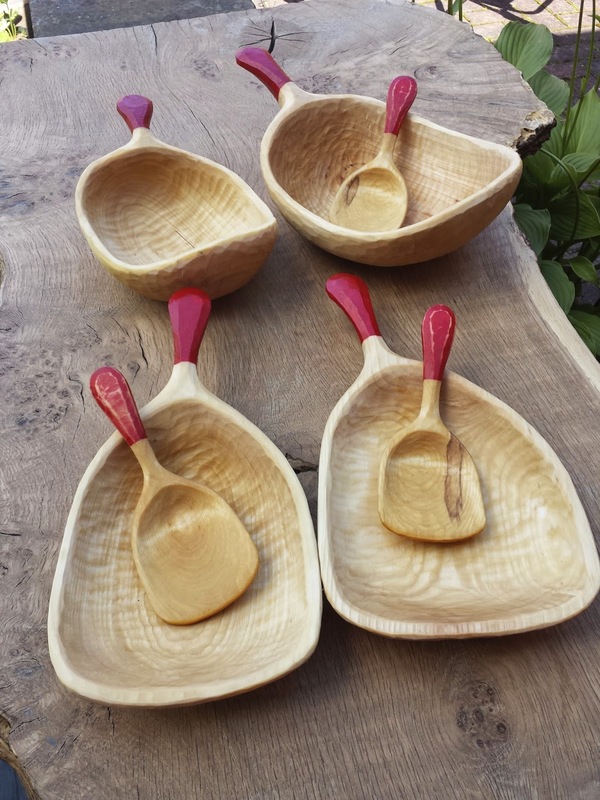 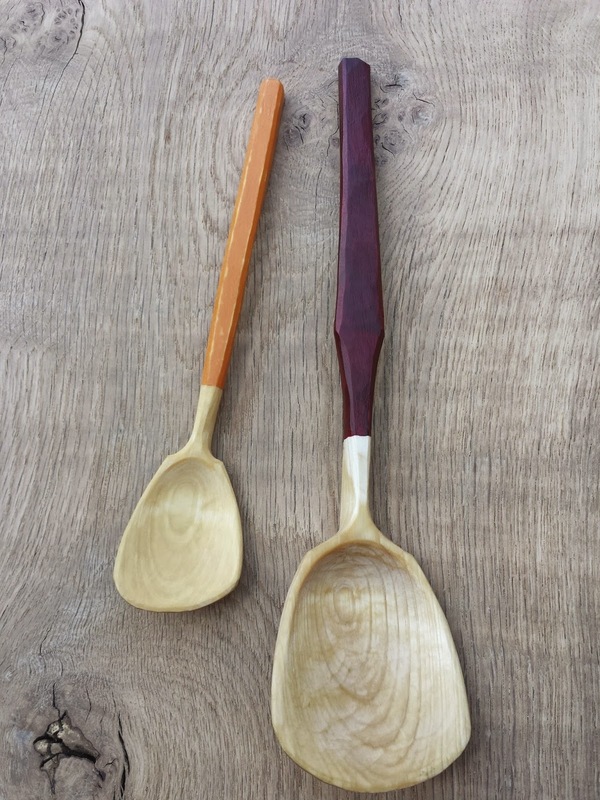 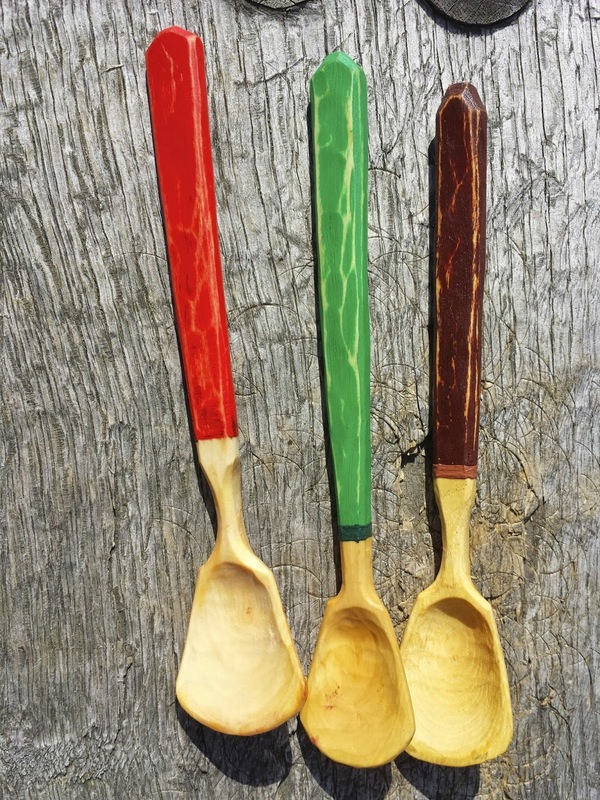 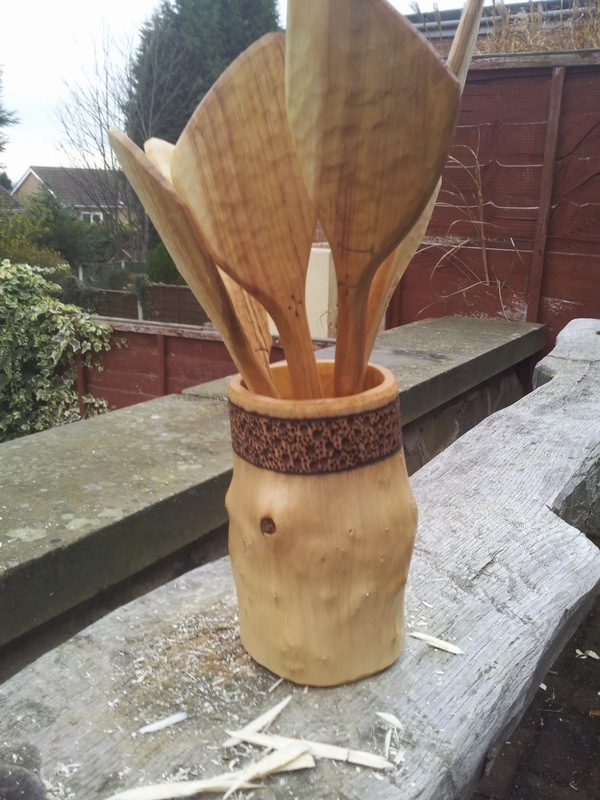 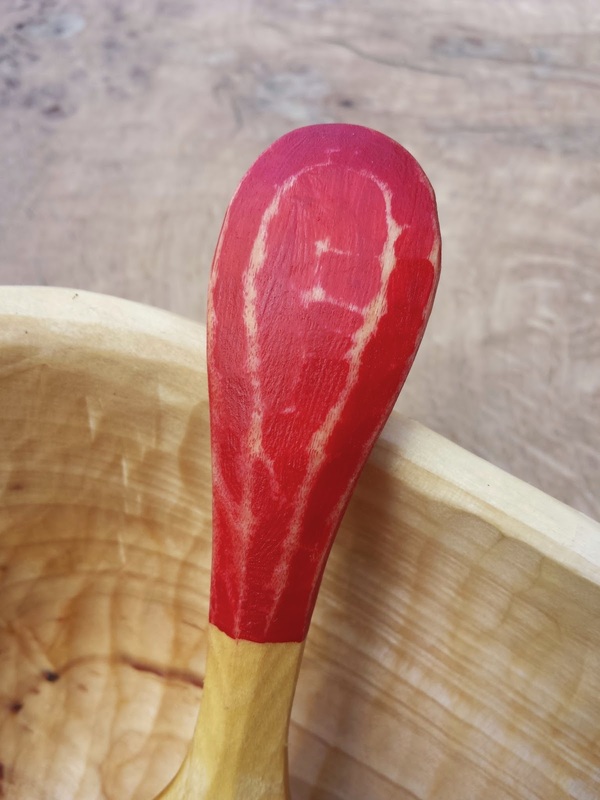 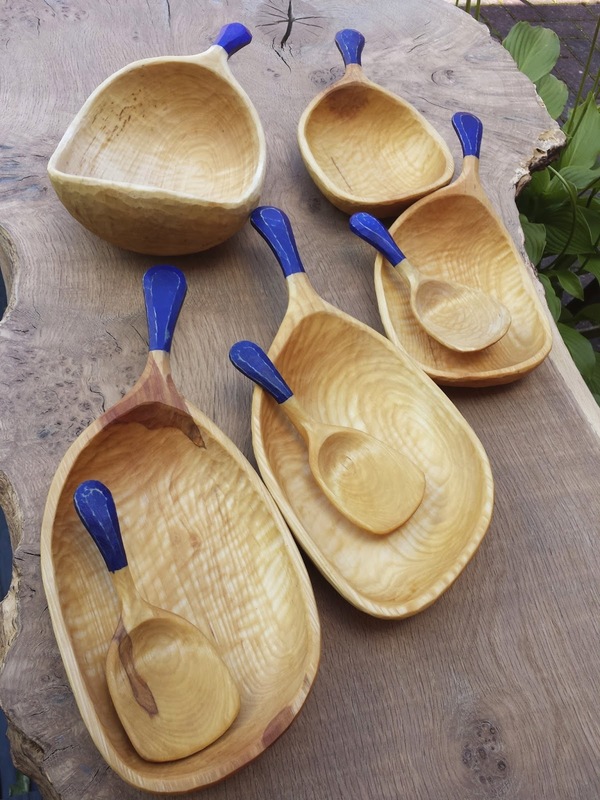 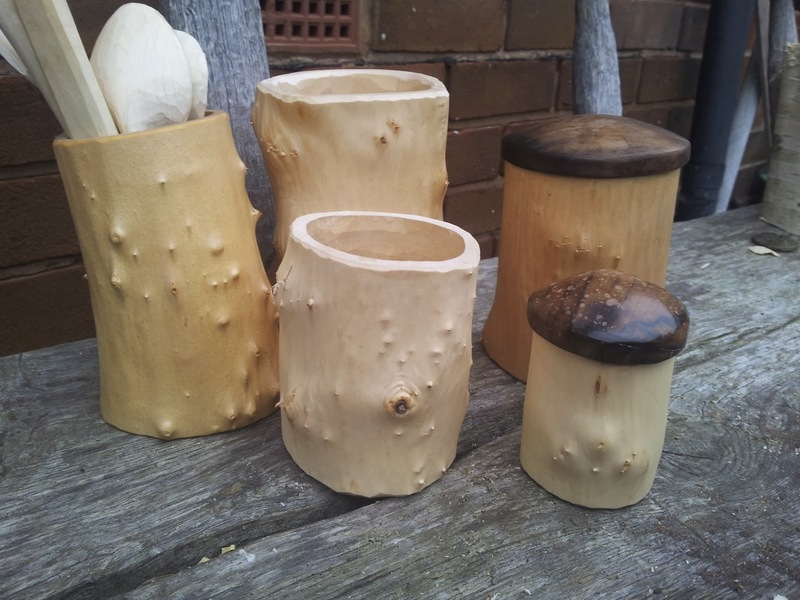 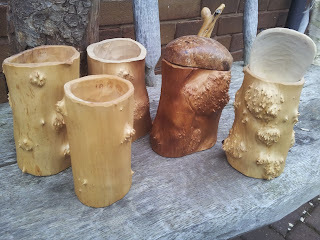 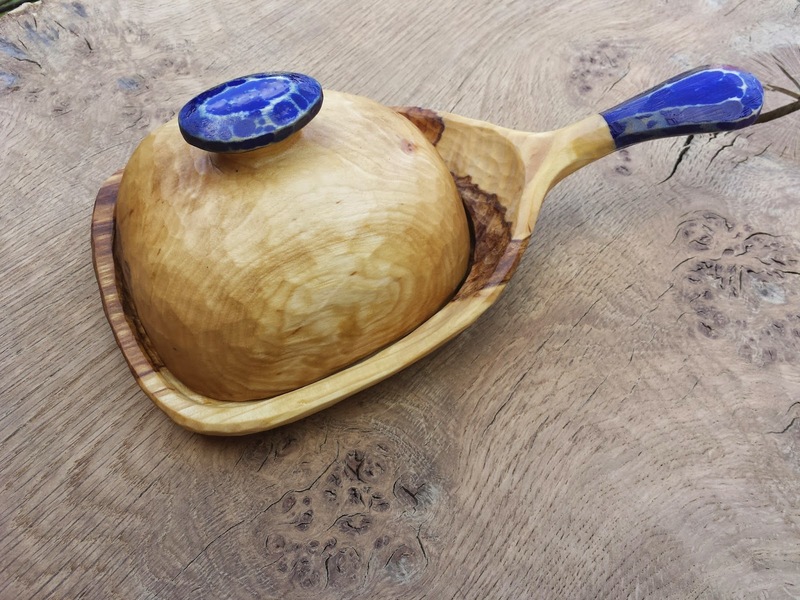 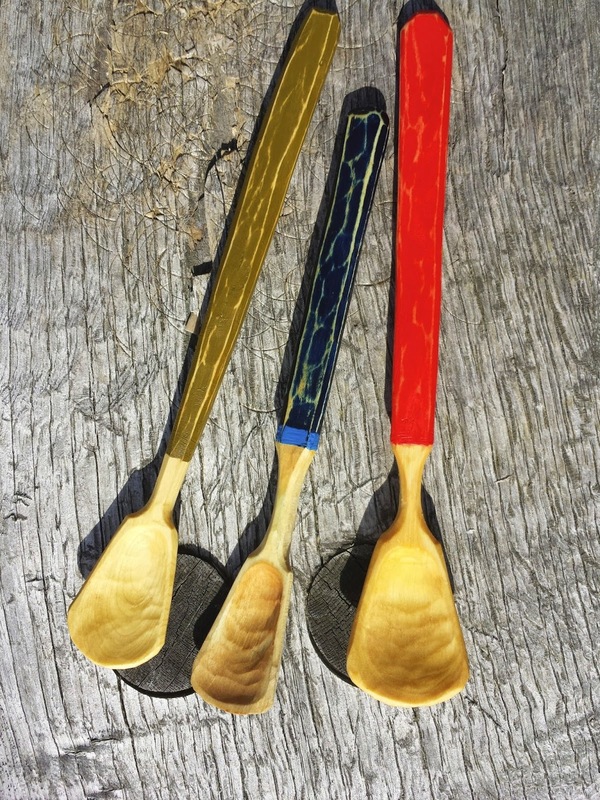 A friend came by the other day and wanted a couple with utensils for christmas gifts, and was remarking about how much he liked the 'bark-on' Birch ones. 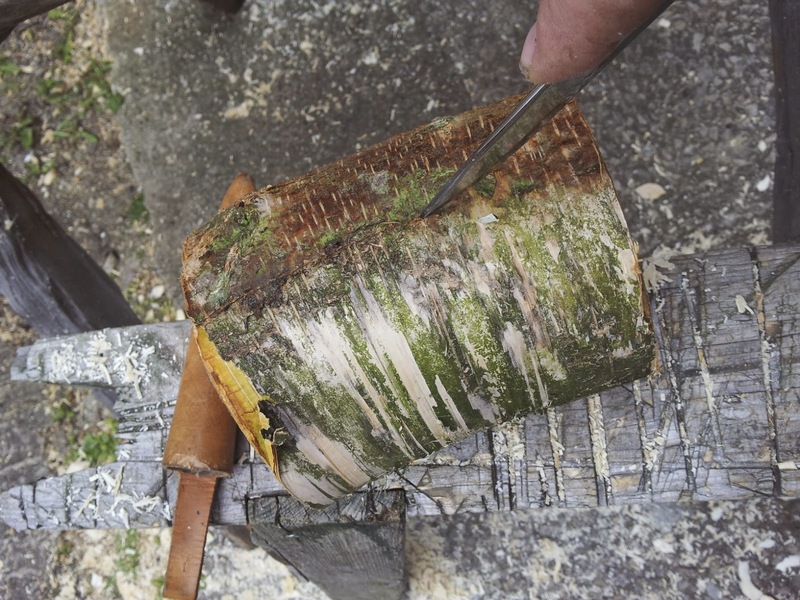 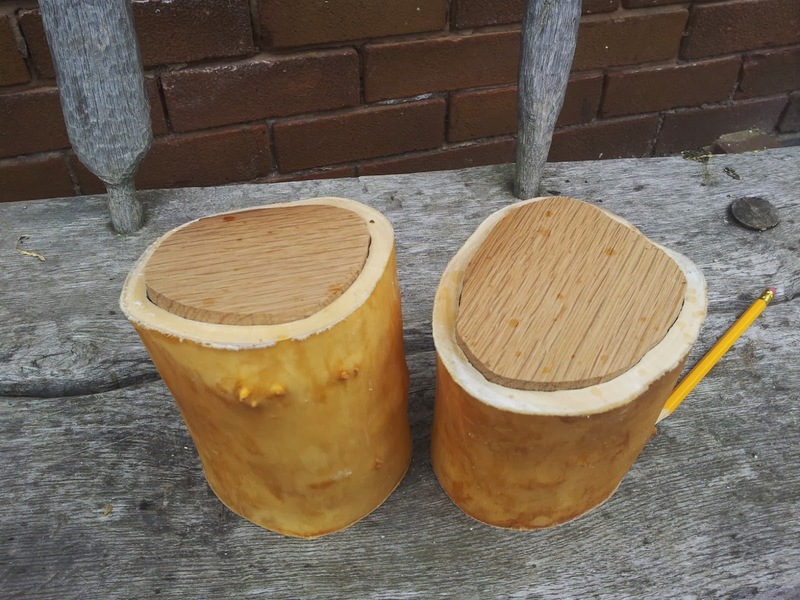 In the uk, now (our winter) is the best time to harvest timber if you want to keep the bark on as it is sap free and tightly adhered to the wood. 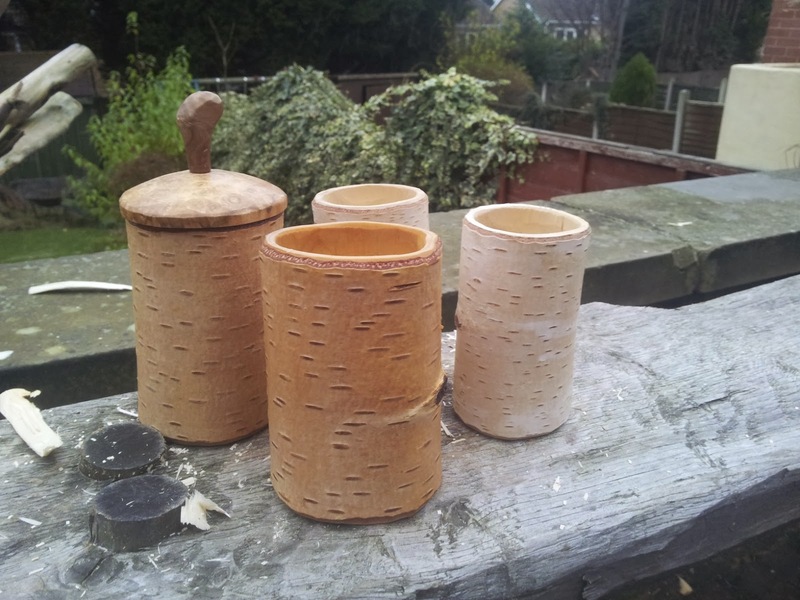 Birch is extremely common here in the Yorkshire coal fields as it seems to be a first populator of derelict pit sites. There is a lot of resource on the net about uses of Birch bark so I won't go into detail here , except to say it is almost leather like in its use here so can be carved or embossed in a similar fashion for ornamentation. 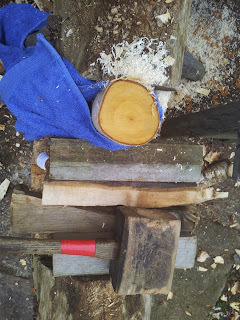 Anyway, I took the opportunity to harvest some that had been damaged by a recent storm. These are the tools (along with a mallet) that I use for 99% of the hollowing out I do. This time I'm protecting the bark from damage in the clamp as it will be staying on. I walloped a few of these out pretty quickly; green timber is nice and easy to work. These are some I did a while ago; the ones on the left have had a quick soaking in Linseed oil and have taken on a pleasing orange hue. 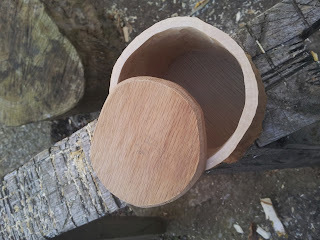 I've posted before about shrink pots but thought it may be of use to some beginners to publish a step by step tutorial of how I make them at the moment. 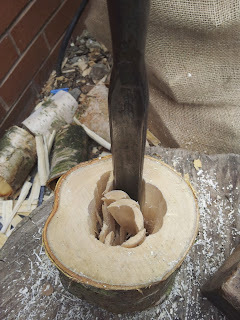 This is just my method, I'm sure there are equally good alternative methods, It's just my personal observations, thoughts and methodology. 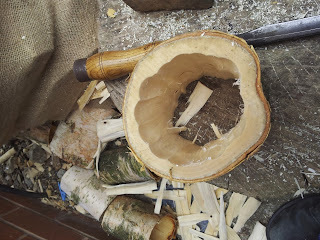 Firstly, I tend to leave the outside of my pots predominantly debarked but natural, so I tend to make them in volume in the spring when the sap is rising. This is because the bark is extremely easy to remove, even over burred sections, as you will see further into the tutorial. 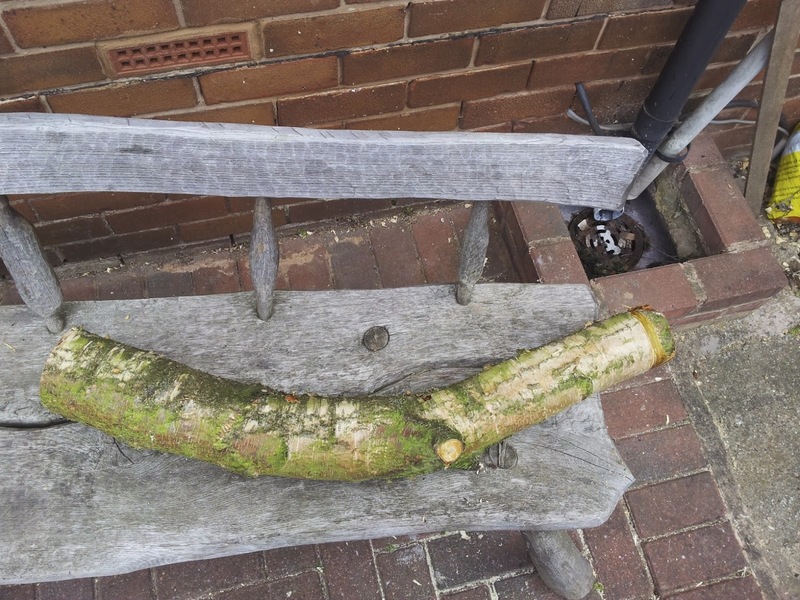 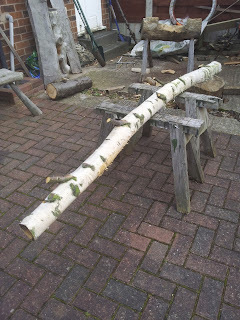 When choosing stock I would advise against using material that has grown under stress such as a twisted branch or branch growing in exposed windy aspect: these tend to give less stable pots that are more likely to split on drying. 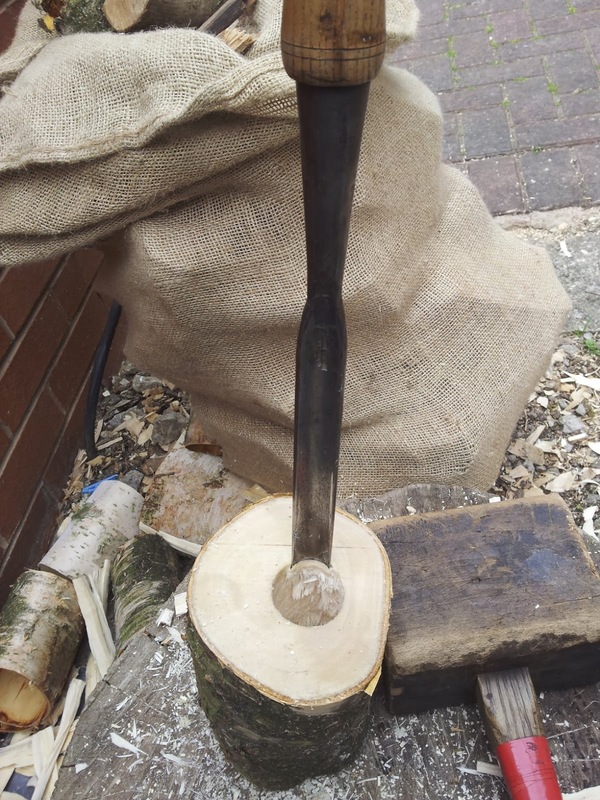 Here's a lump of Silver Birch; it doesn't matter if it's been down a few weeks, it will still shrink enough to seal the base. 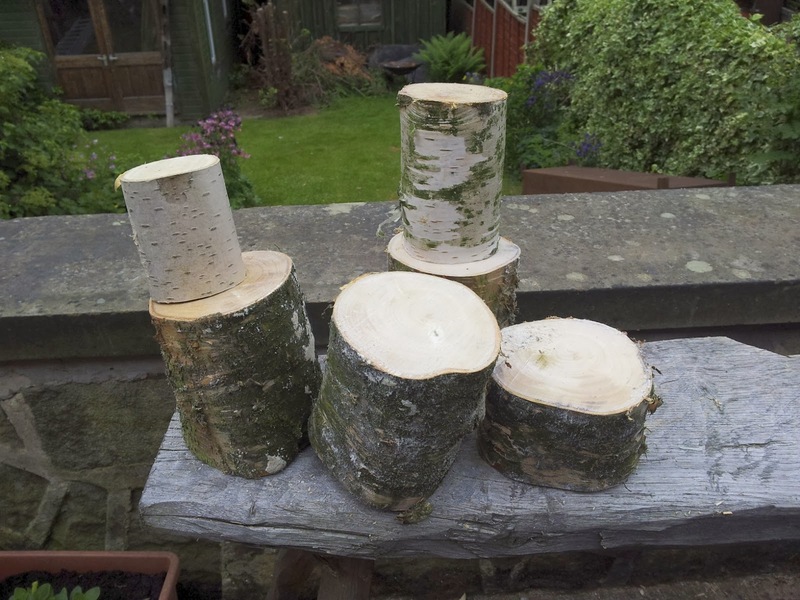 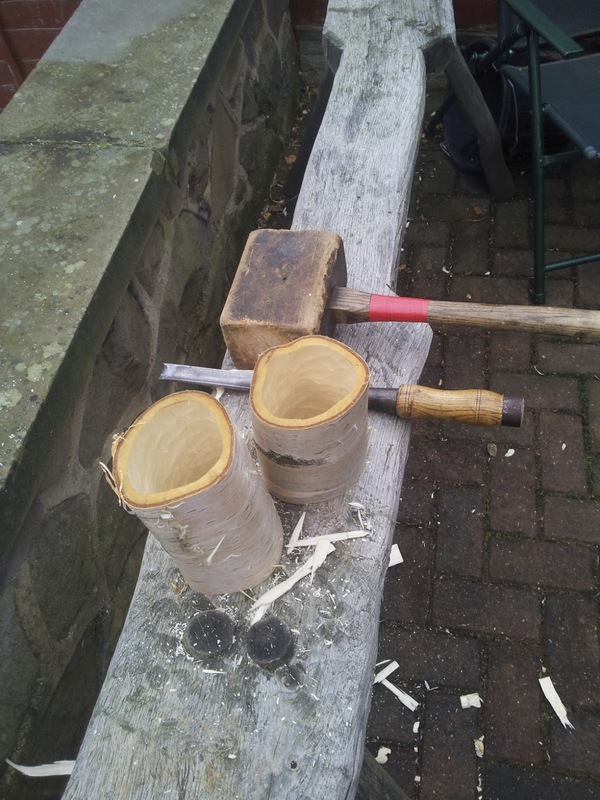 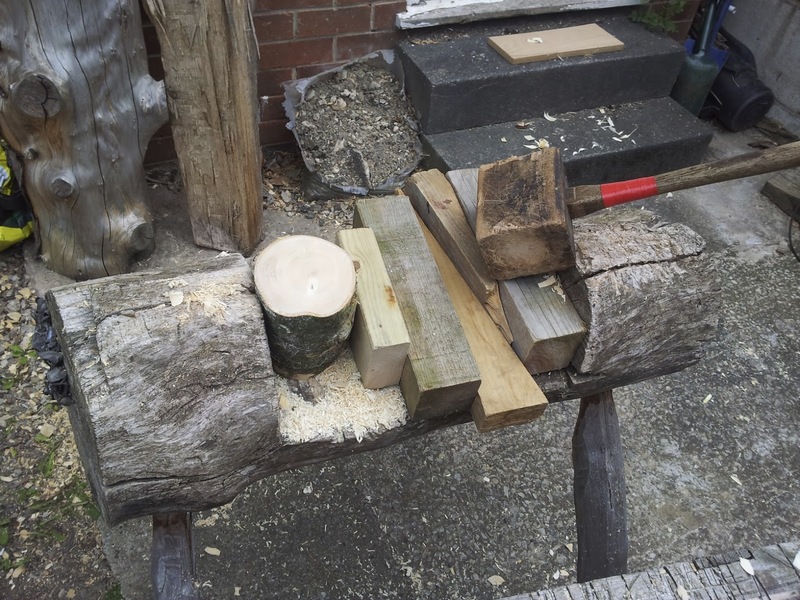 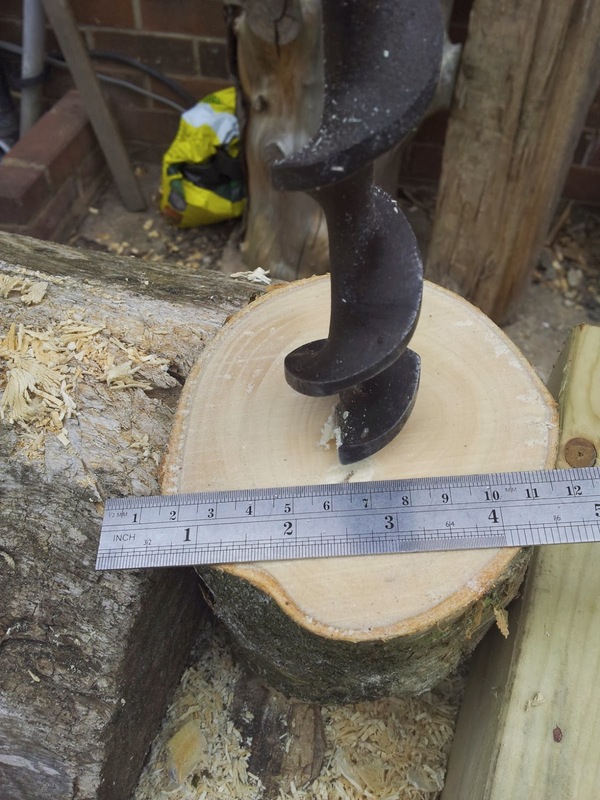 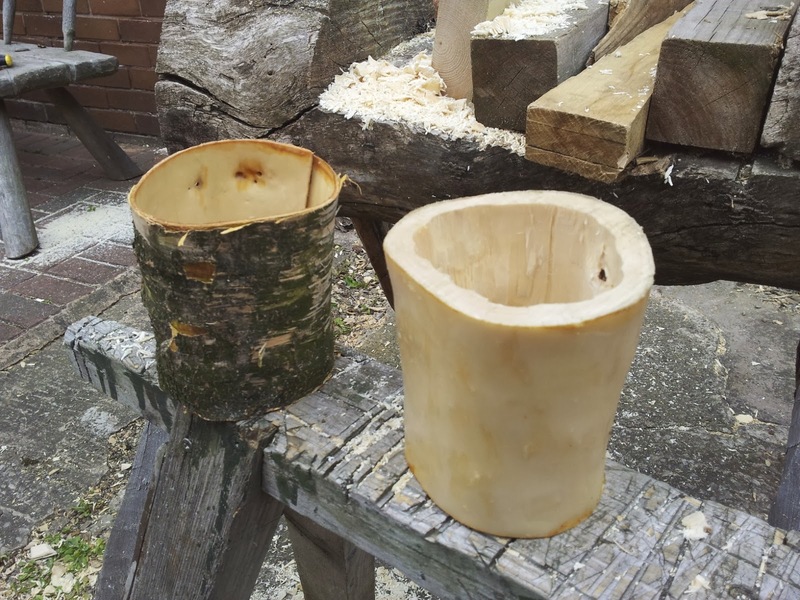 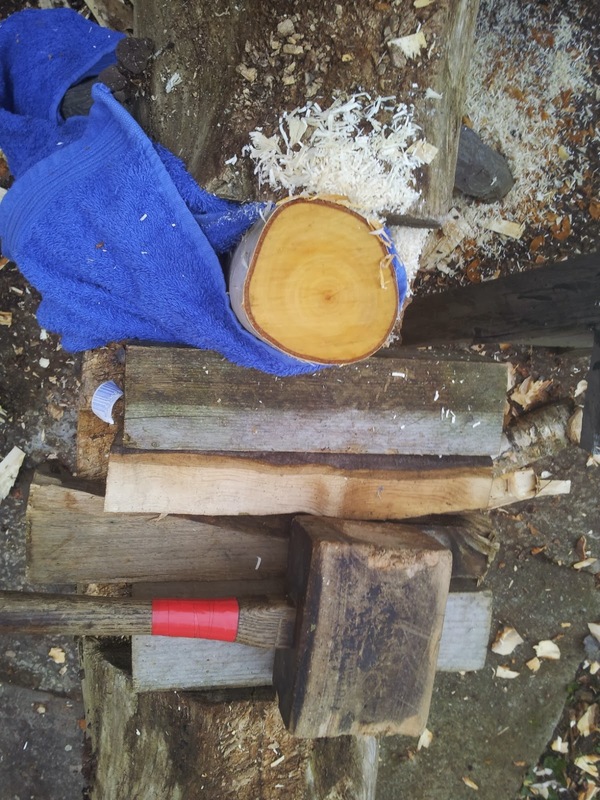 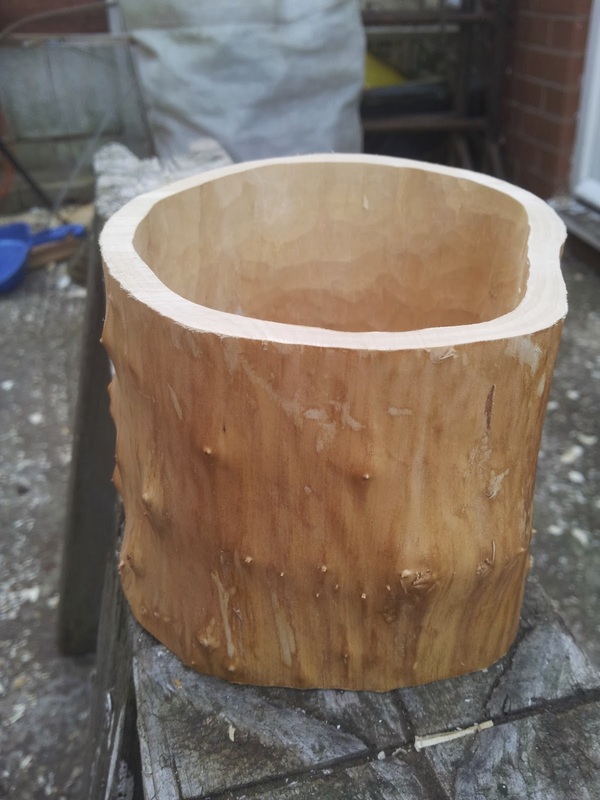 Here I've cross-cut the log into pot sized pieces. 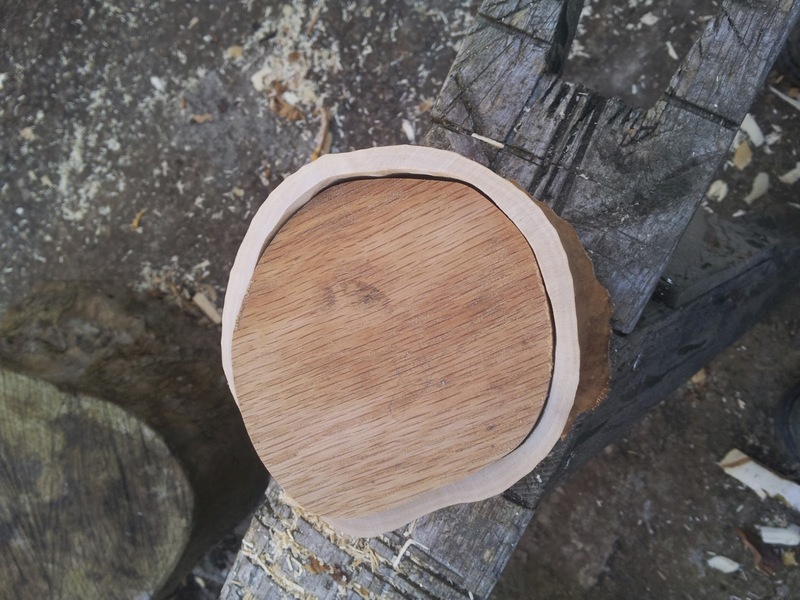 I try to avoid knots or other awkward figuring near the rim or base as this can make things awkward for fitting the base and lid later. 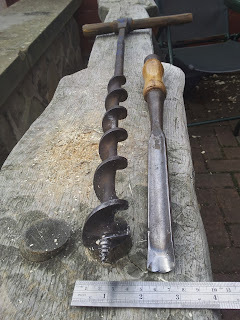 Using hand augers produces quite a lot of torque so I try not to use and auger too wide in diameter relative to the size of the pot . 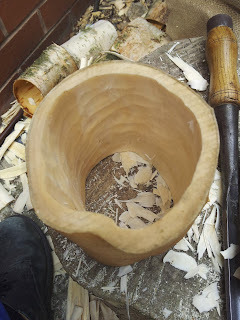 I have split pots at this stage in the past by using too large an auger. 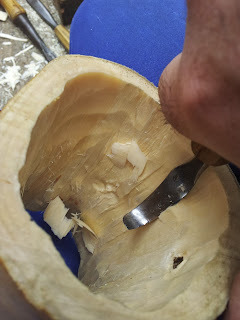 I tend to bore slightly off centre because the pith of some species is quite soft and difficult for the lead screw to bite into. 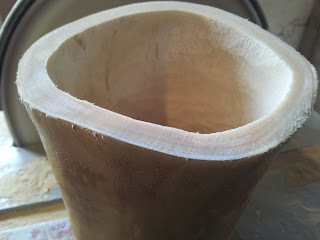 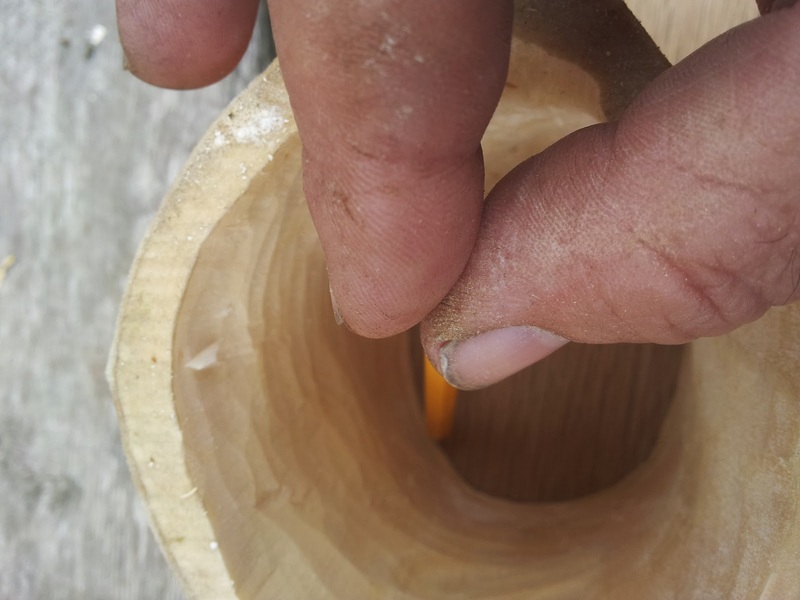 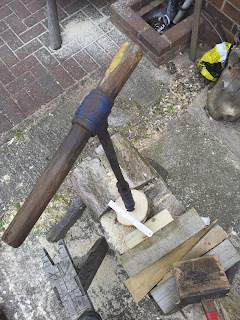 Depending on the size of the pot I may bore straight through or bore from each end to the centre. Next job is to open up the hole with an in channel gouge. Only thing to be aware of is using a gouge of tighter radius than the auger; otherwise you risk getting the gouge pinched (trapped) in the material. 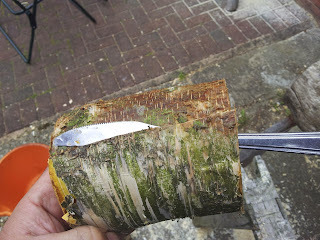 Remove the bark by scoring then peeling with a blunt knife. As you can see, spring harvested timber is easy to peel. 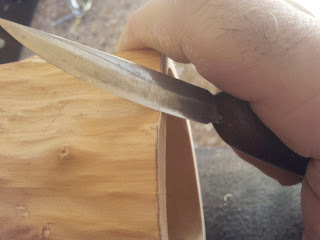 Next smooth the inner walls with the spoon knife down to a thickness of roughly 3/8" at the base and maybe a little thinner at the rim. 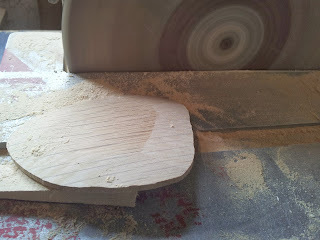 Now I square off the base at the disc sander for a good reference surface for the marking gauge. 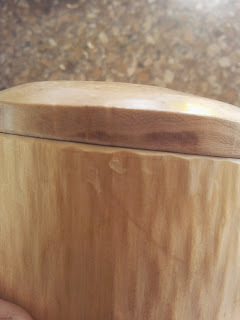 I like to leave a good 1/4" between the bottom of the pot and the base groove. Plough out the groove. 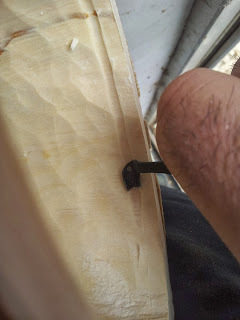 I like to use a flexcut 5mm scorp for this job. Mark out the base disc on some seasoned stock. This is oak about 1/4"-3/8". 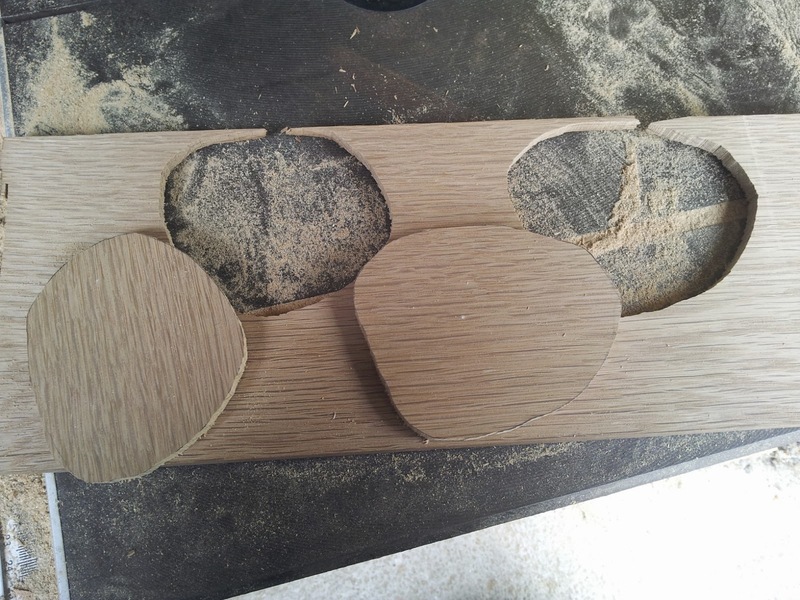 Roughly cut out the discs on the bandsaw fitted with a 1/4" blade. Back to the disc sander for final fitting and thicknessing of the disc to fit into the groove. 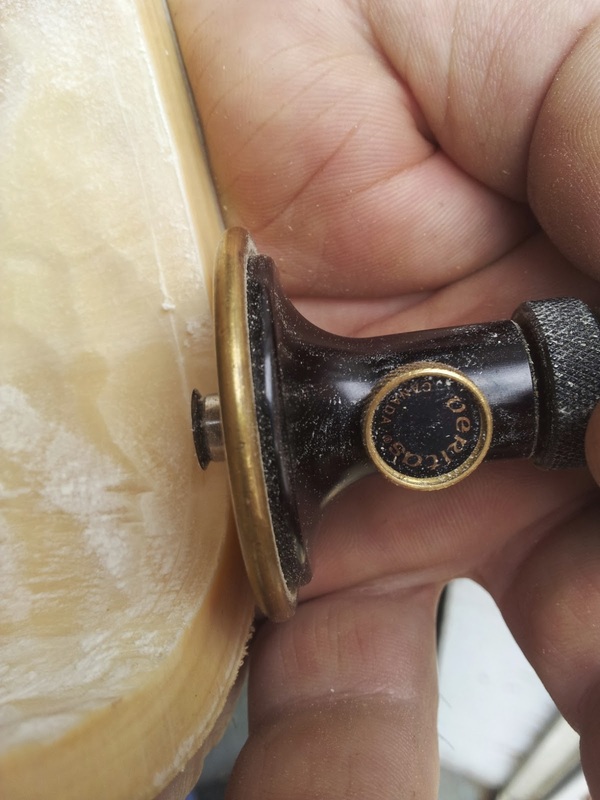 Push the disc into the groove and set aside to dry and shrink to a seal. That's the mechanics of the vessel sorted. 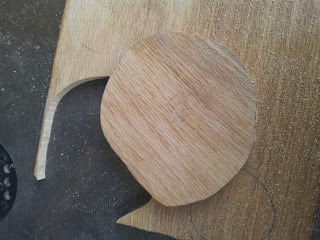 More refinements and examples to follow in part 2.